The main links with your PC and the outside world are the centronic port, used for connecting the printer, the RS232 port, used for the mouse, and the games port for a joystick. This book explores how these input/output (I/O) ports can be put to use through a range of other interfacing applications. This is especially useful for laptop and palmtop PCs which cannot be fitted with internal I/O cards. 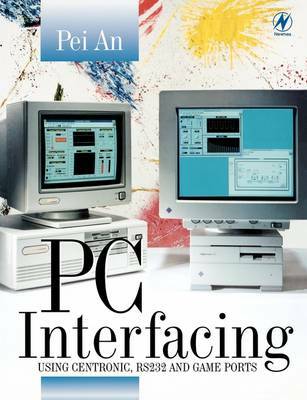 A novel approach is taken by this book, combining the hardware through which the ports can be explored, and the software programming needed to carry out a range of experiments. Circuits are provided for simple testing tools, and three experimental boards - which can also be purchased ready-made. A huge range of applications are considered, turning the PC into a flexible core of a variety of systems. External devices considered include opto-isolator drivers, power drivers, LED drivers, relay drivers, special driver ICs, and methods of driving opto-isolated zero-crossing solid state relays, stepper motors, sound generating devices and displays. Ways of gathering information from the outside world are given, as well as connection to digital devices, remote control and digital communication. As well as teaching in this field, Pei An has written numerous articles for magazines such as Electronics World and Electronics Today International.